Read Across America Day is March 3 and many teachers and students will be celebrating by reading and having classroom discussions about Dr. Seuss’ classic story, The Cat in the Hat. This book is about a girl named Sally and her brother who don’t know what to do on a rainy day. Suddenly, in comes the Cat in a Hat, and that’s when the trouble begins! The pet fish reminds the children that the Cat should not be in the house because their mother is not home. However, the Cat insists on staying and entertaining the children with a variety of tricks. When Mother finally gets home she asks the children what they did while she was out. The kids cannot decide what to tell her. The Cat in the Hat ends by encouraging the readers to decide what they would tell their mothers in that situation. Discuss rainy day activities and create a Rainy Day Bulletin Board. Cut raindrops out of blue paper and have the students write down some rainy day activities on the raindrops to post on the bulletin board. 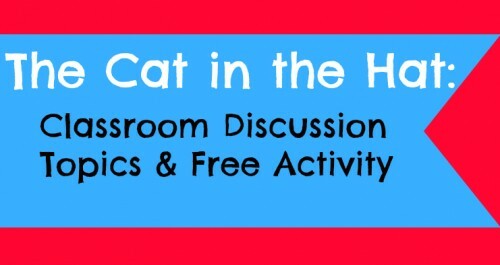 Consider using The Cat in the Hat to introduce your social studies unit about safety or stranger awareness. Collect real hats and/or pictures of hats that can be displayed around the classroom to promote interest. Each day you teach the unit put on a hat (or show a picture of a hat) to signal to students that it is reading time. Encourage students to figure out who would wear such a hat. Have the students wear a hat when it is their turn to read a page out of the book. Discuss the feel and look of the hat and who would typically wear it. Have you ever been left home alone? What activities are you allowed/not allowed to do when you are alone? What would you do if a stranger came to your door while you were home alone? 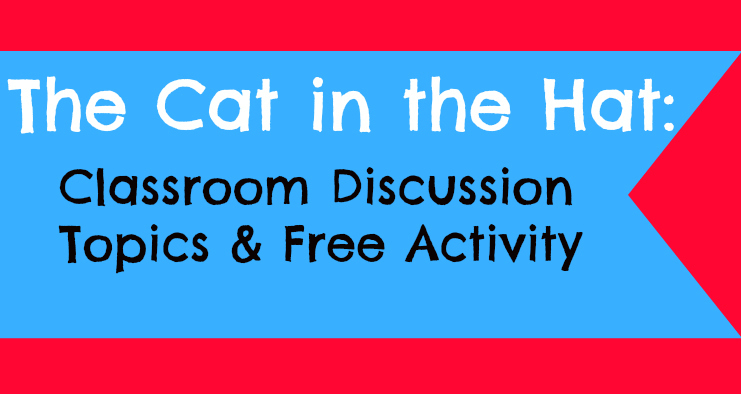 Need more Cat in the Hat activities? 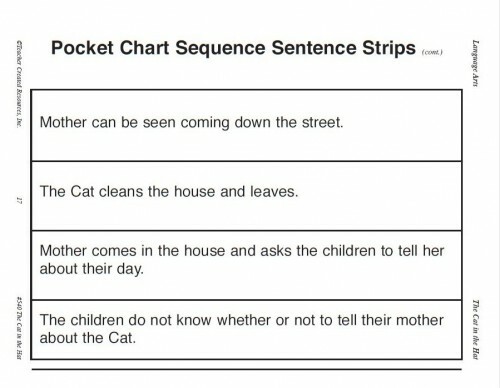 Download the free Pocket Chart Sequence Sentence Strips. 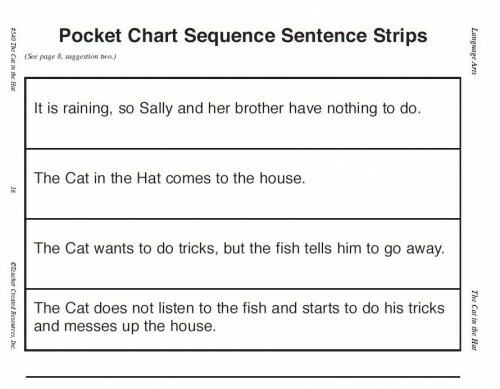 Use the Cat in the Hat sequence sentence strips to create a pocket chart activity. 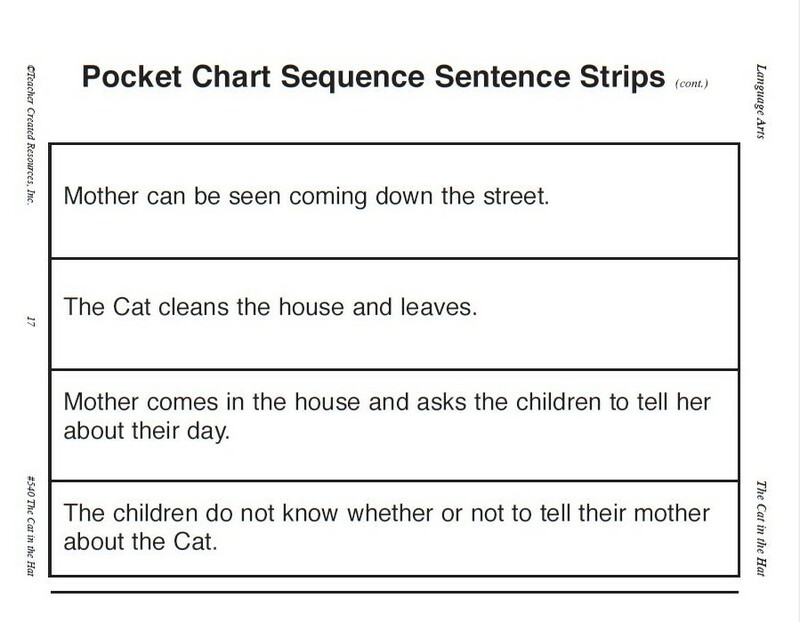 Teach and practice sequencing skills, reproduce, cut out and laminate the sequence sentence strips below. 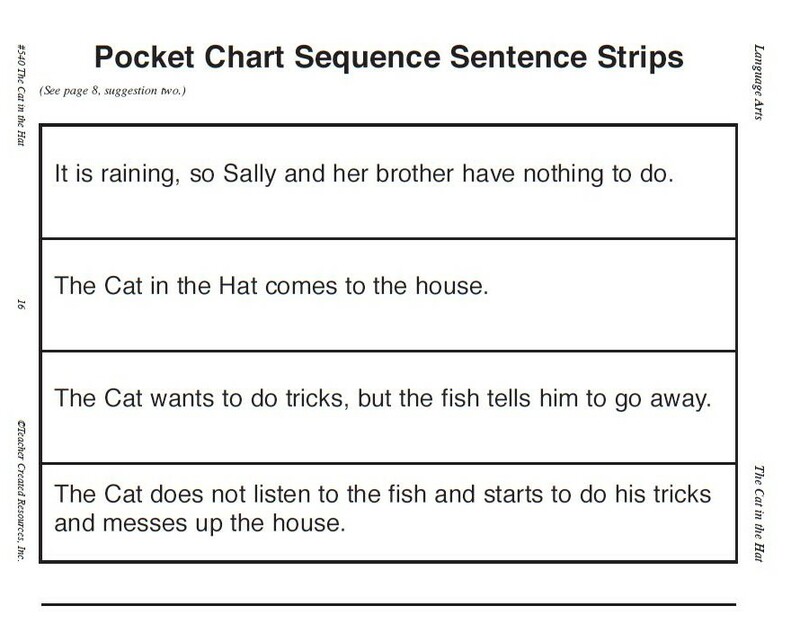 Have the students put them in the correct order and display them on a pocket chart. Students may also work in groups to create a book by cutting the strips, pasting them on drawing paper, and illustrating their sentences. Staple the strips in the correct order and read them to the class.